Members of the Paisley Natural History Society will no doubt recognise our Lesser Whitethroat symbol pictured here, but many may not realise the national significance of having this species breeding in Renfrewshire and the long term efforts that are currently taking place in the county to safeguard the Lesser Whitethroat from future threats. The Lesser Whitethroat Sylvia curruca is a very rare breeding species in Renfrewshire and despite intensive annual searching, the known population amounts to only 1-3 breeding pairs. It has been estimated that the current breeding population of the Lesser Whitethroat in Scotland stands at approximately 400 pairs (Byars 2008). This may seem like a lot but the vast majority are located in SE Scotland, where breeding habitat is far more extensive. In Strathclyde, the known population is around 9-12 breeding pairs and Paisley lies at the NW extremity of its breeding distribution in Europe. What makes this species particularly vulnerable is the main “core” breeding sites are all located within a 1km square around Dykebar and Brownside Braes, SE of Paisley. So what makes these innocuous places so special for the Lesser Whitethroat? After many years study, we have found that habitat plays an important role in the birds breeding distribution. Lesser Whitethroats require a particular type of hawthorn scrub which has a mature open canopy of around 3-4m in height and an impenetrable understorey of bramble, dogrose and gorse at around 1-2m in height, where the birds can nest securely. Our colour ringing studies have shown that male Lesser Whitethroats will occupy the same territories in consecutive years - indicating strong site fidelity and the same returning male will actually build his nest within 10m of the previous location! This microhabitat within the breeding territory is extremely important and birds may desert breeding sites if this microhabitat has changed in any way. Our long term studies have shown the Lesser Whitethroat population has not undergone an exponential increase in Renfrewshire during the study period and this of course set off alarm bells. Due to the perilous breeding status within the county, I felt it would be prudent to safeguard the Lesser Whitethroat and champion this as a species of concern in the county’s Local Biodiversity Action Plan and implement a Species Action Plan accordingly. This SAP was formally introduced by the LBAP steering group in 2004 and the SAP would then provide a viable framework which would monitor the species progress and set about formulating current actions and planned objectives. Most importantly was the obligation to protect the “core sites” in legislation. Lesser Whitethroats have occupied territories in Brownside Braes on a regular basis from 1984 until 2003. Alarmingly, breeding just ceased abruptly and with only an unmated male singing in June 2004, things looked rather bleak. A Lesser Whitethroat held territory through the breeding season in 2008 and what we presumed to be the same male, successfully paired with a female and was seen feeding young in June 2009. This territory was located in a new area of emerging habitat confirming the recent hypothesis, that Lesser Whitethroats require large areas of suitable scrub habitat in various succession ranges to hold sustainable long term breeding populations. In September 2008 the Paisley Natural History Society received a grant for £3000 from the Renfrewshire Environmental Trust (RET). The RET is a local charity which distributes funds through Landfill Tax with the purpose of environmentally enriching the community. This was a great achievement by members of the Paisley Natural History Society. By obtaining this generous grant, it would allow us to start work on a long term project, involving various groups and services to implement a maintenance programme at Brownside Braes. 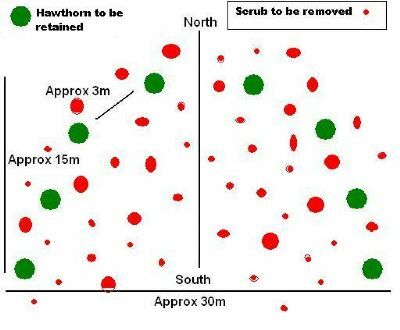 Hawthorn scrub undergoes natural succession and will eventually turn into mature woodland. In order to maintain Lesser Whitethroats at Brownside Braes, a management plan must be implemented. A two pronged approach was needed. 1. Maintain the existing breeding habitat by opening up areas which have become too over mature and dense, thereby allowing light to reach the lower levels and encourage the development of required ground flora to form dense patches. The removal of planted Sycamore and some designated Hawthorns. 2. 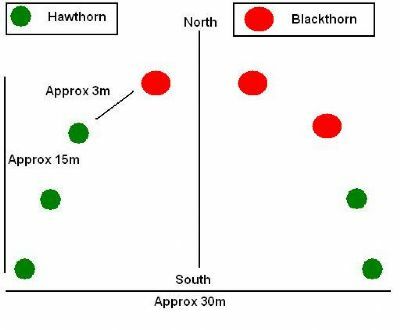 Create new scrubland by planting Hawthorn/Blackthorn along with Bramble, Dogrose and Gorse in designated grassland sites. 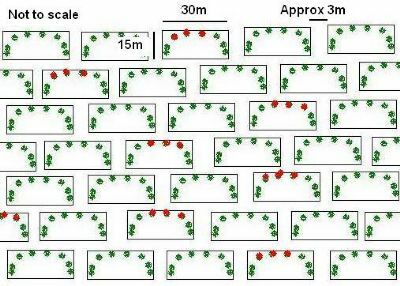 Ground work started in the Winter 2007/08 which involved scrub planting within 4.4ha of designated grassland within zones B & D.
1) Each zone was divided into 15x30m blocks in a staggered pattern (See planting plan above). 2) The inner part of the semi-circle face south with each tree 3-4m apart. The semi circles that contain blackthorn are randomly scattered throughout the planting area. A view of Zone D (looking SE) with the planted areas of Hawthorn & Blackthorn. Areas A & C to be thinned out. Dense habitat blocks will be encircled with marker tape and individual Hawthorn trees will be marked using tape around the boles to identify trees to be kept. This should create an inverted horseshoe shape with the enclosed area facing south. 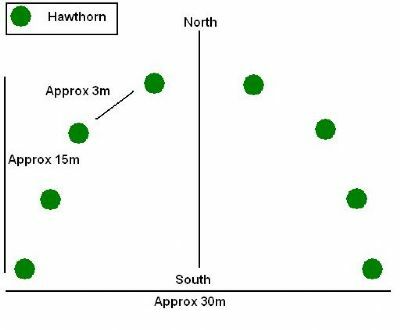 The rest of the unmarked hawthorns will then be cut and the bases treated with Glyphosate to kill the Hawthorn and prevent regrowth. This should open up the mature canopy and allow light down to the lower ground levels. The cut wood will be piled into small mounds to create habitat havens for other wildlife. A view of Zone A showing the scrub clearance undertaken and the ecologically friendly wood piles left in place. The Paisley Natural History Society has an important role to play in the long term project at Brownside Braes and our members are heavily involved in various wildlife orientated activities based here. Society members have been involved in studying the Lesser Whitethroat here since 1983 and every Spring members try to locate singing Lesser Whitethroats and map out all known territories within the park boundary. This survey is not only exclusive to Lesser Whitethroats as other important LBAP species are also recorded singing and breeding populations estimated. 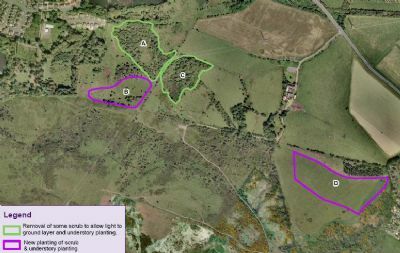 This mapping gives an indication into habitat utilisation and breeding densities within the site, which also provides an important conservation tool. Bird ringing is also conducted at this site and mist net locations need to be properly maintained from invasive scrub growth. The PNHS members can help clear and manage the net rides scattered throughout the park. Members of the society can also provide help in planting scrub species in the project area and aid in the removal of unwanted plant species as well. PNHS members will be involved in the long term monitoring of the scrub enhancement project to ensure that the planted areas are progressing properly under the project remit. It is hoped that the local communities in the vicinity of Brownside Braes can be heavily involved with this long term project. 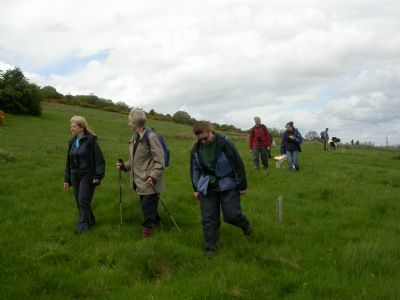 Co-ordination with the Glennifer Braes Country Park Ranger Service is vitally important, as they can link up with other organisations such as community councils, community information teams, outdoor groups, schools and youth organisations. 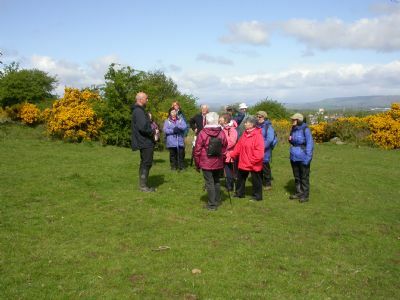 Tom Byars taking Evergreen members on a guided walk around Brownside Braes during May 2009. Information to the public is important and promotion of this project is vital. Press and television will be informed about the project and guided walks and indoor talks provided by PNHS members and the Park Ranger Service should be conducted annually to promote this venture to the local public. Other ways the project could be brought to the public attention is through the Paisley Natural History Society website, yearly summary placed in the PNHS annual report and through the increasing society membership by word of mouth. Paisley Natural History Society and Glasgow Natural History Society members on a combined “Bioblitz” survey of Brownside Braes in June 2009.